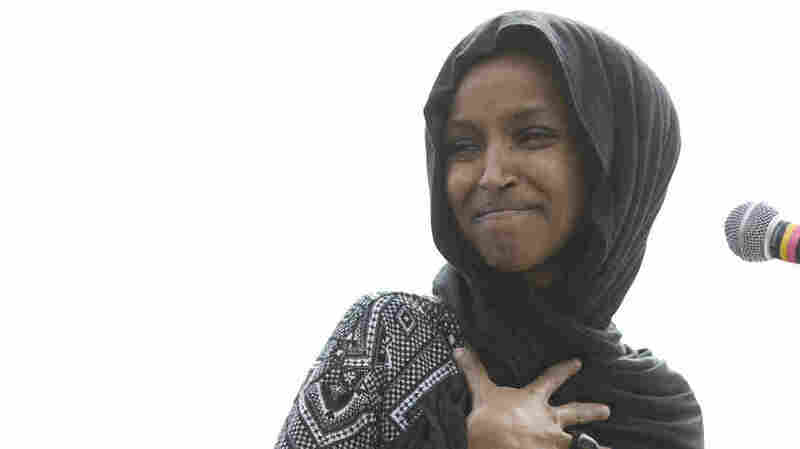 'New York Post' Criticized For 9/11 Photo Paired With Ilhan Omar Quote The newspaper's cover paired an image from the 2001 terrorist attacks with a partial quote by Omar. Fellow lawmakers and activists expressed outrage at the paper's editorial decision. Rep. Ilhan Omar, D-Minn., attends a Youth Climate Strike on March 15 in Washington. On Thursday, the New York Post drew criticism after featuring a partial quote by Omar with an image from the Sept. 11, 2001, terrorist attacks. The quote came from a speech Rep. Ilhan Omar, D-Minn., gave last month. She was speaking at a banquet hosted by the Council on American-Islamic Relations, discussing how terrorism has led to a rise in Islamophobia. Days after the banquet, critics zeroed in on her description of the terrorist attacks, inciting outrage that bore resemblance to the condemnation she received after making remarks about Israel. On Fox & Friends, co-host Brian Kilmeade told viewers, "You have to wonder if [Omar] is an American first." "This woman is a disgrace," Donald Trump Jr. tweeted. Rep. Dan Crenshaw, R-Texas, a former Navy SEAL who lost an eye in a bombing in Afghanistan, said it was "unbelievable." "You described an act of terrorism on American soil that killed thousands of innocent lives as 'some people did something.' It's still unbelievable," he later wrote on Twitter. Rep. Ben Ray Luján, D-N.M., and assistant speaker in the House, told MSNBC, "Those statements were not only hurtful to me, but extremely hurtful to everyone that was personally impacted by those terrorist attacks." But the Post's incendiary cover, released at a time when owner Rupert Murdoch and Fox have come under intense scrutiny, has made it the target of a different strain of anger. "Their intention was to be inflammatory, to generate sales at the expense of dividing our country," Hassan Shibly, head of CAIR's Florida chapter, tells NPR. "Far too many people have tried to blame, even retaliate, against Muslim communities when we are victims of that attack just like all Americans," Shibly says. Omar continues to receive death threats, he says. "Obviously the first hijab-wearing, American Muslim woman [in Congress] is going to be the first target," he says. "People's deep-seated hatred for the Muslim community is now being projected onto her." Joseph Azam, one of Murdoch's former top executives, described the newspaper cover as "the virulent anti-Muslim bigotry being put out by various parts of the Murdoch empire." Azam recently told NPR he left his post because he was sickened by the coverage of Muslims, race and immigration in Murdoch's outlets. "They are going to get ppl killed - is that the goal?" Azam tweeted Thursday. House colleagues came to Omar's aid. Rep. Rashida Tlaib, D-Mich., tweeted, "The NY Post knows exactly what it's doing - taking quotes out of context and evoking painful imagery to spread hate and endangering the life of Rep. Omar. Shame on them, and shame on Rupert Murdoch." Rep. Alexandria Ocasio-Cortez,‏ D-N.Y., called the cover "horrifying" and "hateful," before adding that Omar co-sponsored the September 11th Victim Compensation Fund. She told reporters that the wrath against Omar was "not a normal level of political debate or rhetoric." The New York Post did not immediately respond to NPR's requests for comment. On Friday, Omar herself quoted words uttered in the wake of Sept. 11 by former President George W. Bush, adding, "Was Bush downplaying the terrorist attack?" The newspaper cover wasn't the first time Omar was linked to the Sept. 11 attacks. A poster at a winter event sponsored by the Republican Party of West Virginia showed a photo of the congresswoman, wearing a hijab, beneath a photo of the twin towers engulfed by flames. A group called ACT for America, which had set up a table near that poster, describes itself as a national security organization and is labeled as an anti-Muslim hate group, promoted the Post cover on Twitter. It called Omar's rhetoric "dangerous." According to a 2018 Pew Research Center estimate, Muslims made up about 3.45 million people in the United States in 2017, slightly more than 1 percent of the total population.